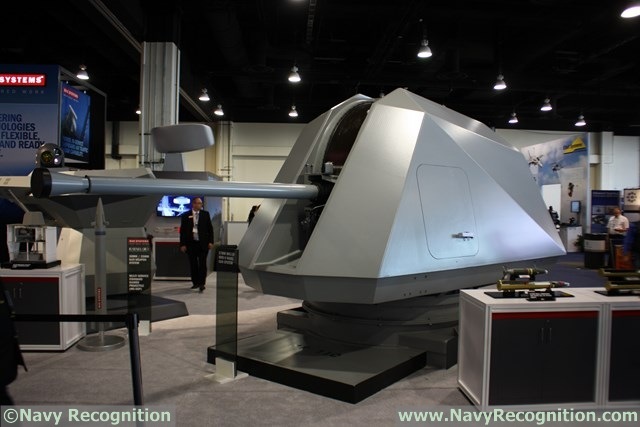 BAE Systems at the Navy League’s 2015 Sea-Air-Space Exposition is showcasing for the first time a new 57mm guided projectile: The Ordnance for Rapid Kill of Attack Craft or ORKA (technical designation: MK295 MOD 1). The new round is designed to be shot from the 57mm MK110 fitted on both types of US Navy Littoral Combat Ships. Currently at design stage, the ORKA is BAE Systems answer to a US Navy requirement aiming at increasing the accuracy and efficiency of naval rounds. Navy Recognition learned that BAE Systems engineers applied the technology developed and mastered with the 127mm and 155mm to the much smaller 57mm. ORKA is a "One Shot One Kill" round fitted with an imaging semi-active seeker: It can be guided through laser designation or it can hit its target autonomously by downloading image of the target prior to firing. BAE Systems confirmed that the ORKA retains the 3P multiple fuzing modes (timed, proximity and point detonation) found on the existing 57mm round. The Mk295 Mod 1 incorporates a reliable and affordable 4-canard actuation systems, to guide the round; a multi-mode imaging seeker and a hihgh explosive warhead to enable single shot defeat of Anti-Surface Warfare and Anti-Aircraft Warfare threats.